John and Vicki Pearse in 1971, the year they started their careers at UCSC. Photo by Ralph Buchsbaum. The Western Society of Naturalists has awarded its 2008 Lifetime Achievement Award to UCSC biologists John and Vicki Pearse. John Pearse, a professor emeritus of ecology and evolutionary biology, and his wife, Vicki, a research associate at the Institute of Marine Sciences, are both experts on marine invertebrates. The Lifetime Achievement Award was established in 2005 to honor an outstanding scientist who has been involved in the Western Society of Naturalists (WSN) throughout his or her career and has made an exemplary life-long contribution to increasing our understanding of natural history. The Pearses were honored at the annual WSN meeting in Vancouver, British Columbia, earlier this month. Both have long been active leaders in WSN and other scientific societies. John served as president of WSN, California Academy of Sciences, International Society of Invertebrate Reproduction, and Society for Integrative and Comparative Biology. Vicki has served as president of the American Microscopical Society and editor of the journal Invertebrate Biology. The Pearses are passionate about marine invertebrates and have shared their enthusiasm with a multitude of students and colleagues. 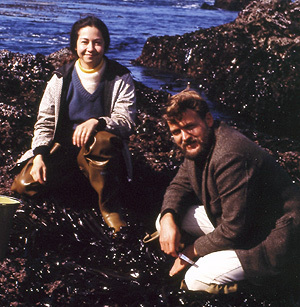 John's research has spanned reproductive biology and the ecology of kelp forests and the rocky intertidal zone. The two have worked separately and as a team, and although their studies have focused mostly on the California coast, they have ranged from tropical to Antarctic waters. The Pearses are coeditors, with Arthur Giese, of the 9-volume treatise Reproduction of Marine Invertebrates. They also coauthored, with Vicki's parents, Ralph and Mildred Buchsbaum, the textbook Living Invertebrates (an expanded version of Animals Without Backbones). John and Vicki Pearse are both fellows of the California Academy of Sciences. John is also a fellow of the American Association for the Advancement of Science and has received numerous awards and honors during his career, including several teaching awards from UCSC and the American University of Cairo, Egypt, where he taught before coming to UCSC in 1971.